"BYB Brawl 1: Brawl For It ALL" will revolutionize bare-knuckles fighting with its Trigon Triangle cage - 7' high fences, two beveled corners and a 60-degree, tight third-corner forming a triangle, totaling 187 square feet - on Friday night, April 5, at Cheyenne Ice & Event Center in Cheyenne, Wyoming. This will mark the first time a professional bare-knuckles event is held inside a cage. This will also be the first time bare-knuckles fighting and MMA are contested in a cage on the same night. 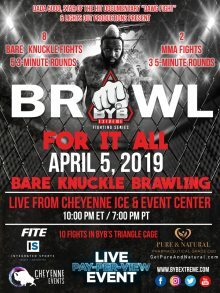 "BYB Brawl 1: Brawl For It ALL" is a presentation of BYB Extreme Fighting Series (BYB), bare-knuckle fighting's most intense promotional company.